To address the issue of domestic violence in our community at large through preventative methods. To provide preventative care, treatment and rehabilitation of persons without regard to race, color, creed, national origin, socio economic statue, marital status, sexual preference, disability or political affiliation, suffering from the effects of domestic violence. To initiate, direct and participate in educational programs for preventative recognition of and encouragement of treatment of those persons adversely affected by domestic violence. To direct efforts to the overall improvements of the quality of life for those adversely affected by domestic violence. To provide sheltered housing for persons who have been battered. To recruit and train volunteers to assist in furtherance of the battered person. The Family Center, Inc. dba Angels of Grace Battered Women’s Shelter and Anna’s Place targeted area if the First Judicial District of Eastern Arkansas which includes Phillips, Lee, Monroe, St. Francis Cross, and Woodruff Counties. All services are accessible to people with disabilities and provided at no cost. statewide are prepared to receive and assist you. 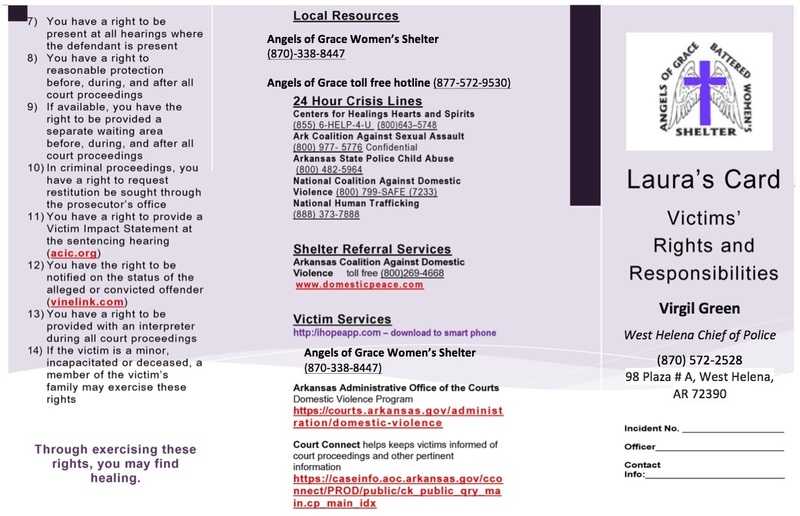 Angels of Grace Battered Women’s Shelter and Anna’s Place are a division of The Family Center, Inc. which is a non-profit corporation recognized by the Internal Revenue Services as a 501 (c) 3 organization. The Family Center, Inc. is managed by a Board of Directors who live in the areas served by the agency.